AIA's Telescope Assembly ATA-1 suffered a misnamed Camera-4 anomaly. It is visible in the Sun Today images as well as in the FITS files. Here is an example from the 335 channel, where the dark area circled and the "scan lines" pointed at are example of a Camera-4 fault. The fault is automatically cleared within a few images but tends to reoccur until the camera is reset. These flaws will be visible is some 335 and 131 images between 12/22 13:15:17 UT and the reset at 19:37:54. The SDO ground station complex Near White Sands, New Mexico is currently receiving snow and there may be some intermittent data drops out due to this weather. The Comet Lovejoy watch has been reported in Space.com. It was pretty amazing to the see the comet emerge from behind the Sun! Perhaps we will see it in the SoHO and STEREO coronagraphs today. Check out the SDO youtube page for lots of good movies. Check out the emergence video at under favorites. Out out 171 and 193 as your first attempts. We see the the comet in 171 at 23:58:59! At 23:59:18 in 193! The AIA team has reported seeing Comet Lovejoy coming out from behind the Sun after perihelion at about 00:41. We are starting to receive the images and copy them into our directories. Our special website for the Comet Lovejoy perihelion approach is http://sdo.gsfc.nasa.gov/data/lovejoy.php. There are movies and a Twitter feed at the site now. Images that may contain the comet will be flowing at about 7 pm ET this evening. SoHo and STEREO continue to watch Comet Lovejoy as it moves closer to the Sun and brightens. We will be running a special mode this evening to look for the Sun in the SDO instruments. showing how bright the comet is earlier today. Will SDO see another comet? We are setting up a special website to watch Comet Lovejoy pass by the Sun tomorrow night. The URL will be published tomorrow afternoon. You will be able to examine the special off-point images for signatures of the comet! The Helioviewer website is also available for making movies and looking for the comet. Comet Lovejoy was discovered on November 27, 2011. It is a Kreutz comet, one of a family of comets that move along the same orbit---much like the meteoroids in a meteor shower. These comets come so close to the Sun that they are called sun-grazing comets. Comet Lovejoy may become one of the brightest Kreutz comets ever seen. The latest estimates are a visible magnitude of -3. (Bright stars are magnitude -1 or dimmer.) We are making special efforts to see Comet Lovejoy this week. Thursday night at 7:30 pm ET Comet Lovejoy will move through its closest approach to the Sun. Starting at 23:30 UTC (6:30 pm ET) Thursday we will point the SDO spacecraft a little to the left of its usual position. 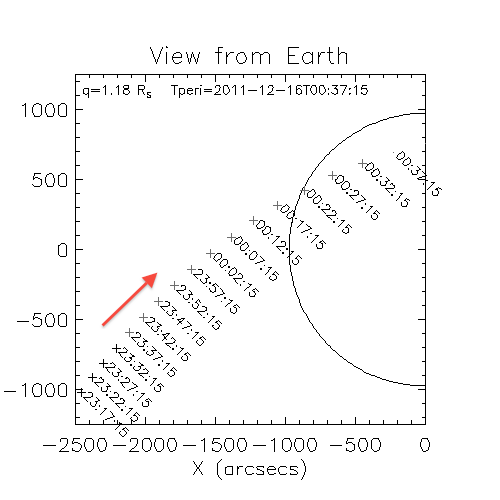 The images will look like this figure, where the circle is the edge of the Sun and the X’s are where we estimate the comet will be and the red arrow shows the direction the comet moves. Watching from SDO the comet goes behind at 00:22 UTC (7:22 pm ET). All three instruments on SDO will be watching the comet. 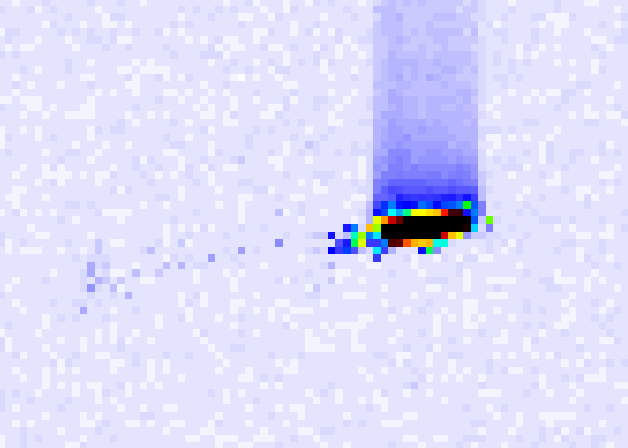 The EUV images from AIA would show the second comet seen in these ultraviolet wavelengths (the first was in July). HMI and AIA can use the comet to understand the roll of the spacecraft. EVE might see some of the atomic ions responsible for making the comet bright in the EUV. In July we saw a Kreutz comet disappear as it passed across the face of the Sun, why does it go behind the Sun this time? The way we see a Kruetz comet depends on where we look from. 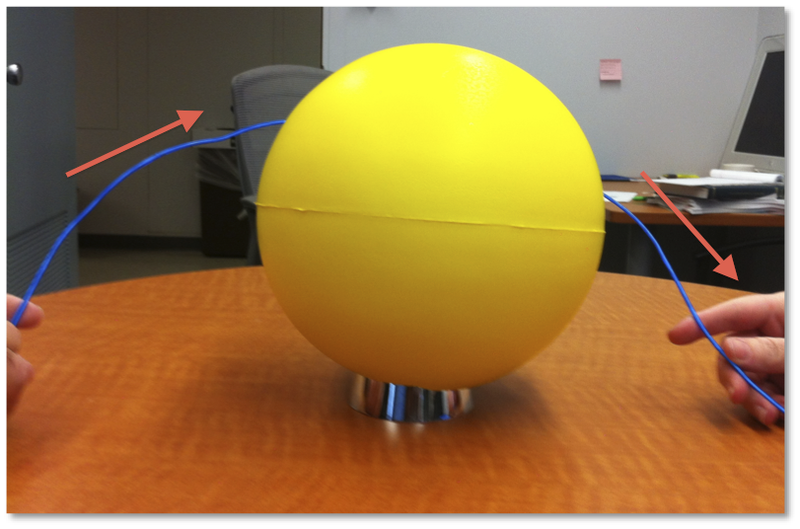 We have constructed a 3-D model of the comet orbit from blue wire and a yellow sphere. The top picture shows how the comet will move Thursday night; up from below the ecliptic, behind the Sun, and then back down, generally moving from left to right. A view from the July position of the Earth is shown in the lower picture. The comet seen then moved up and across the face of the Sun (from right to left) because the Earth and SDO were on the other side of our orbit. Amazing fact #1: A Kreutz comet takes 800-900 years to orbit the Sun. Because its closest approach (or perihelion) is only 0.2 solar radii above the Sun’s photosphere, each comet must travel 150-200 AU (out near Sedna) out into space before returning! Amazing fact #2: No Kreutz comet seen by SoHO has survived perihelion passage. The comets go behind the occulting disk and do not re-appear. They probably evaporate in the fierce heat of the Sun. Amazing fact #3: SDO is not the only satellite that will be watching Comet Lovejoy. 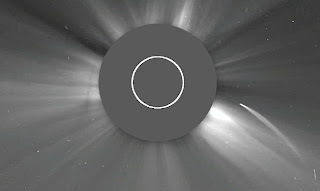 Coronagraphs on STEREO and SOHO are already seeing the comet move toward the Sun. It should a great show! New SDO App for the iPhone! 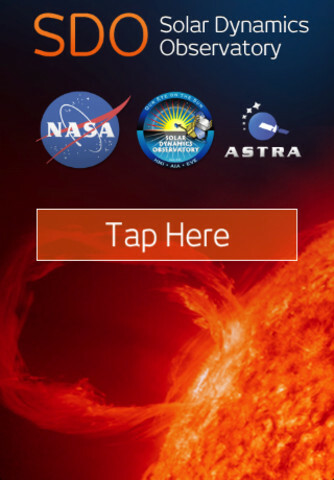 Check out the new SDO App for the iPhone. You can even order T-shirts with SDO images on them. 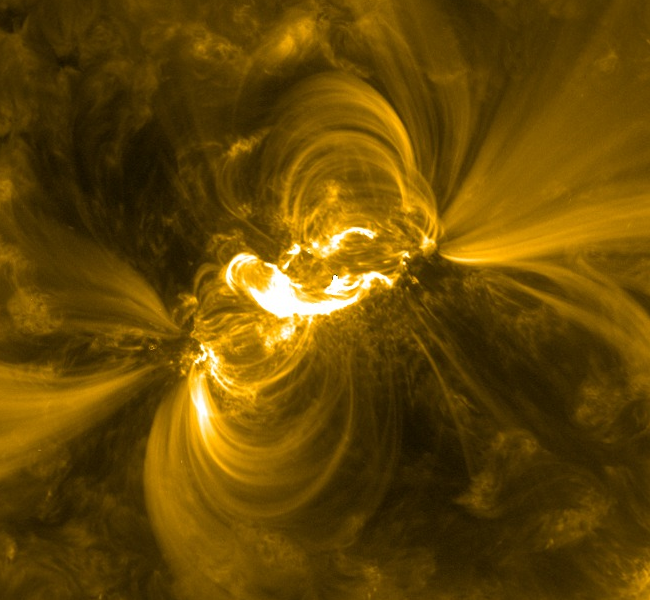 SDO images are featured this week in an Editor's Pick at CNET News. The FOT and Science Teams monitored Reaction Wheel speeds and instrument performance as the maximum wheel speeds on wheels 3 and 4 slowly rose above 850 RPM. Wheel speed predicts have indicated that the wheel speeds should soon begin reducing on their own, but this has not yet happened. A momentum unload has been scheduled for 12/7 and will be performed if the wheel speeds have not begun to reduce on their own by then. On 12/1 the FOT began seeing sustained winds of approximately 45 mph at both SDO1 and SDO2 antennas. They contacted SDO personnel at WSC who indicated the latest forecast for overnight was for gusts up to 85 mph. The FOT alerted SSMO management and the Mission Director (MD). A teleconference was held with the SDO Project Scientist, the FOT, the MD and SSMO management to plan for the extreme wind event. It was decided to staff overnight in the MOC and at WSC. After winds at SDO2 exceeded 65 mph for 3 samples within a 5 minute period, SDO2 was automatically braked as of 02:35 GMT on 12/2. The highest wind speed recorded at SDO2 was 74 MPH. After the winds died down, SDO2 was brought back online as of 05:50 GMT with manual workarounds. The automatic recovery of SDO2 failed due to ACA faults, apparently caused by antenna motion while it was braked. SDO1 only experienced a few wind speed readings over 65 MPH and remained on point. However, due to the very high winds, there were Ka band dropouts at SDO1 while SDO2 was braked. There were also subsequent short periods of simultaneous data loss at both SDO1 and SDO2 because of the very high winds. Preliminary estimates put the data capture for 12/2, Day Of Year 336, at 94 percent. Lessons learned from this exceptional wind event will be discussed next week. Along with the Santa Ana winds over LA the winds at White Sands are predicted to be very high this evening (>80 mph). 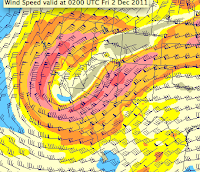 Here is the forecast wind pattern at 24,000 ft over the Southwest US for 7 pm MT this evening. If the winds exceed 65 mph for more than 5 minutes the SDO antennas will be stowed (pointed up and turned off). There will be no science data if the antennas are stowed. Update 12/2/2011: The winds were quite high last night (gusts to 70 mph) and the antennas were braked several times but never stowed. Along with the high winds came large gusts that moved the antennas off the spacecraft. That means we had some data loss over night. Winds are predicted to be high today and tonight, although maybe not as high as last night. We have seen many beautiful prominence eruptions with the AIA telescopes. 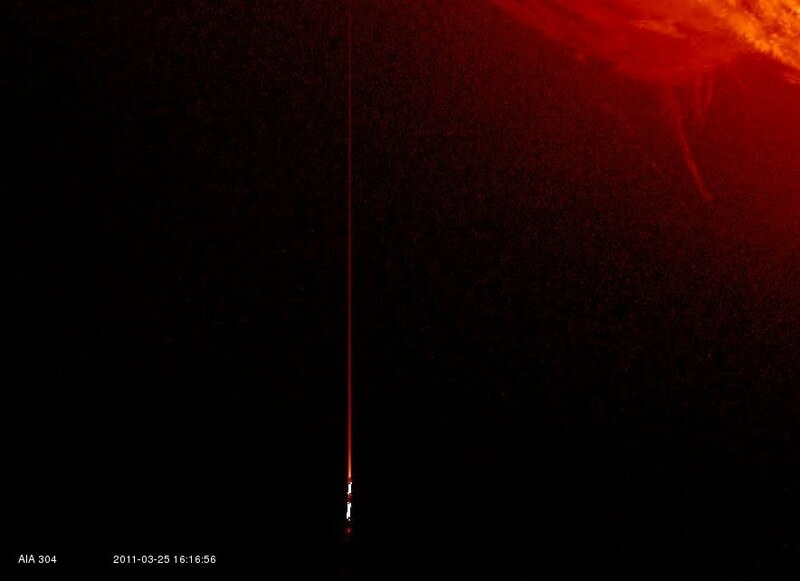 The prominence eruption on June 7, 2011 has made the Washington Post's Space Exploration gallery of 2011. Make sure you check out the movies in several wavelengths in the SDO Gallery. Ever wonder we have Eastern (or Mountain, or Pacific) Standard Time? You can thank the railroads. On November 18, 1889 railroads in the United States began using the set of "Standard" timezones that we more or less use today. 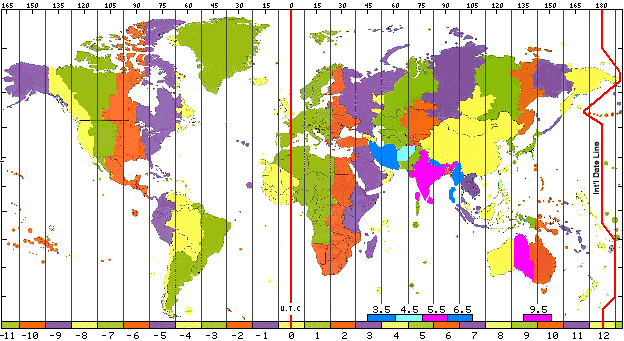 The color blobs in this figure show the timezones used today around the world. Before standard time each community kept track of time. Some important times (such as noon) where announced by ringing bells or another signal. Imagine a train arriving in one town before it left the last one! Not everyone was happy and some towns continued to use local solar time until 1918. Today we release SDO marked in Coordinated Universal Time (diplomatically called UTC) and International Atomic Time (similarly, TAI). TAI is the number of seconds since midnite January 1, 1958. A series of laboratories keep track of the march of time. UTC maps TAI to almost local solar time at the Greenwich Meridian in England (the line where longitude is 0). This means that UTC has leap seconds to keep up with the slowing down of the Earth's rotation. Right now we have added 34 leap seconds to UTC. We like TAI because it is easy to do differences in time by subtracting the TAI times. This is not true for UTC. When you look an SDO timestamp it will say Z or UTC if the time is UTC; T or TAI when it is TAI. Aníbal António Cavaco Silva, the President of Portugal, visited the AIA video wall at the LMSAL offices in Palo Alto, CA on November 14, 2011. Here is a picture of Karel Schrijver, the PI for AIA, showing President Silva some of AIA's finest images. An X1.9 Flare at 2011 Nov 03 2027 UT! Active region AR11339 let go an X1.9 flare 2011 Nov 03 2027 UT. This large and complex active region just rotated onto the disk and we will watch it for the next 10 days. AIA images have been sporadically available this week as AIA recovers from a computer failure and we work out alternate paths to create the images posted to the Sun Now and Sun Today websites. At this time some images are being posted at a 3-minute cadence rather than the normal 15-minute cadence. If this causes a problem when browsing the images please use the NTH option to display every 5th image. We are sorry for any inconvenience. Yesterday we ran the EVE cruciform. 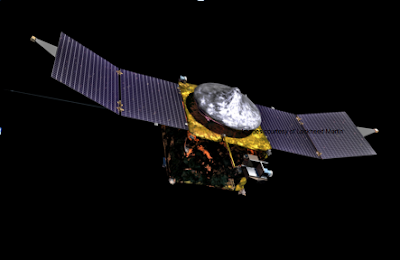 Some images are missing and others are cropped or partial as the spacecraft moves along the path needed to help calibrate the EVE instrument. The Flight Operations Team monitored the end of eclipse season on 10/4. The FOT postponed lowering the spacecraft bus voltage to accommodate a request from the Atmospheric Imaging Assembly (AIA) team to provide more heater power for a 36 hour bake-out of ATA #4. The bake-out was performed successfully on 10/4-10/5. The bus voltage was reduced on 10/6 to the normal full sun voltage to maintain the battery at 60% state of charge. ATA #4 of AIA was heated to drive off contaminants that have been building up. Both the 304 and 94 Å channels were unavailable Tuesday evening and most of Wednesday. Today, October 6, 2011, is German-American Day, when we celebrate the arrival of German immigrants in Philadelphia in 1683. Germans have worked in physics for many years. Joseph Fraunhofer discovered the spectral lines in the Sun we call Fraunhofer lines. We measure the brightness, Doppler shift, and magnetic field effects of those spectral lines on SDO to study solar activity. At left we show the spectrum near the iron line at 6173 Å used by HMI to measure the velocity and magnetic field at the surface of the Sun. The slight motion to the left and right is what happens as the surface moves back and forth. Another German, Heinrich Schwabe, wrote down the number of black specks he saw on the Sun for almost 20 years. When plotted we see the number of spots rising and falling with about a 10 year cycle. Schwabe had discovered the solar cycle. 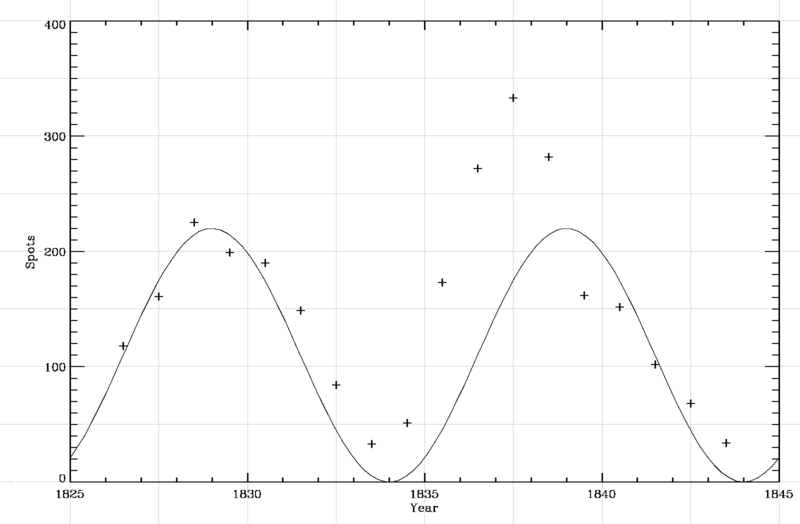 Here is a plot of Schwabe's data from his article Sonnen-Beobachtungen im Jahre 1843. The rise and fall can be seen in the crosses that show the number of spots in each year. I drew a sine curve with a 10 year period so you can see what Schwabe announced. Also called the 11-year sunspot cycle, we still measure the number of spots and produce the Sunspot Number. Along the way we have invented many more ways to measure spectra and active regions. We are posting these videos for public review and would like your help in locating a comet that maybe visible from the AIA telescopes. 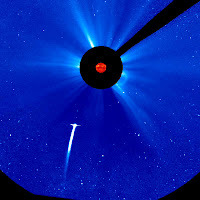 At 2011/10/01 13:25, a sun-grazing or Kreutz comet could be seen by LASCO C2 (see first video) barreling towards the sun. At 2011/10/01 18:12, it entered the occulting disk and we believe the AIA telescopes may have viewed the comet stepping across the face of the sun. For the highest quality videos right click on the links below the videos and save them to your computer. This video posted on youtube is an example of what you're looking for. If you do find our missing comet tweet your finds to @NASA_SDO. Do sun-grazing comets cause CMEs? Check out http://sungrazer.nrl.navy.mil/index.php?p=news/comets_cmes for some thoughts about the coincidences between comets, occulter disks, and CMEs. Neptune was discovered one Neptune year ago. On September 23, 1846 Neptune was seen near its predicted location, with the discovery credited to Johann Galle, John Couch Adams, and Urbain Le Verrier. On Jul 7, 2011 Neptune completed its first orbit around the Sun since that day. Neptune is far from the Sun and very cold. I wonder if you would worry about Space Weather if you lived on (or floated in the clouds of) Neptune? Today is the autumnal equinox, the first day of fall. Thanks to the increased solar activity of Solar Cycle 24, the UARS satellite will re-enter this afternoon. As it re-enters it will break up into a large number of pieces, some of which may make it to the ground. The predicted ground tracks for today have been calculated by the Aerospace Corporation and can be seen at http://reentrynews.aero.org/1991063b.html. The orange circle is the splashdown point. An active region is rotating into view on the Sun's limb. This morning it let loose with a X1.4 flare. Let's hope for more as the active region continues to rotate onto the disk. I like the way the tops of the loops saturate and bloom while the loops remain visible. A little bit of spray at 11:02:34, but if a prominence eruption also happened it was before the flare started. Thanks to Sam Freeland for this movie using the 211, 193, and 171 Å bandpasses of AIA. A high-res version of the video is available at http://sdowww.lmsal.com/sdomedia/h264/2011/09/22/SSW_cutout_20110922T1024-20110922T1159_AIA_211-193-171_N09E89.mov. The Sunspot Number is 194! According to the drawings at the Solar Influences Data Analysis Center SIDC, September 16, 2011 had a sunspot number of 194. That's 74 spots and 12 groups. Looks good in the magnetic field from HMI as well. Still on track for a below average sunspot number for Solar Cycle 24, but we are seeing some good activity now. The Flight Operations Team prepared for the third SDO orbit stationkeeping maneuver (SK3) planned for 9/21. The flatsat run was completed on 9/15 and the CAM materials were delivered on 9/16. New weather monitoring stations were installed at the SDO1 and SDO2 antennas to replace units which failed during recent severe weather. 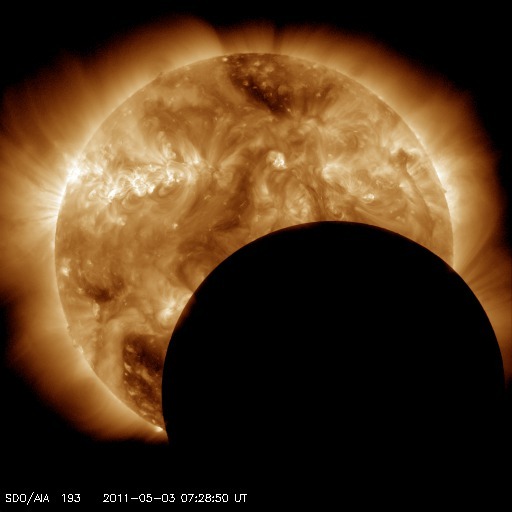 The Fall 2011 eclipse season started today. Here is an AIA 171 image from 0657 UT with the first eclipse! SDO has eclipse seasons twice a year near each equinox. For three weeks near midnight Las Cruces time (about 0700 UT) our orbit has the Earth pass between SDO and the Sun. These eclipses can last up to 72 minutes in the middle of an eclipse season. The current eclipse season started on September 11 and lasts until October 4. The continuous contact with the ground station our orbit allows was judged to outweigh the loss of some images. 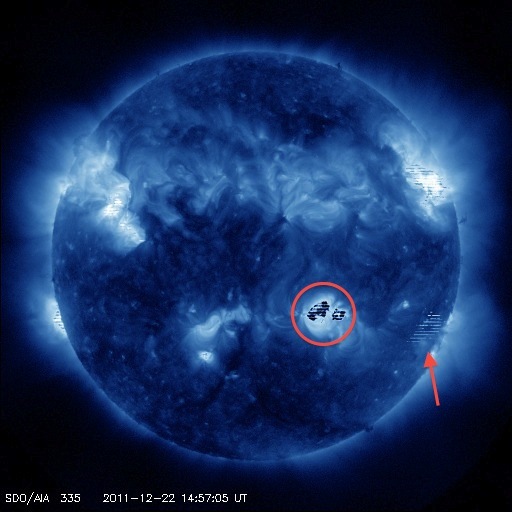 Active region 1283 produced an M5.3-class flare yesterday morning and an X2.1-class flare last night at 2220 UT. And another X-class flare today at 2238 UT. Check out the supporting material for the EVE press conference at http://www.nasa.gov/sunearth. Its all about flares, the energy they release, and the effects here in our atmosphere. September 1, the Birthday of Space Weather! 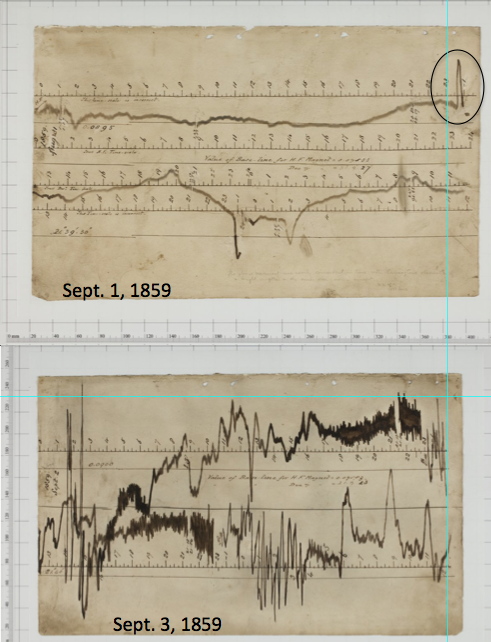 On September 1, 1859 Richard Carrington observed a solar flare while drawing sunspots. Rather than look at the same drawing of sunspots that we always see, let's look at the magnetometer records released this year by the British Geological Survey (see "Search the Collection" at this link.) 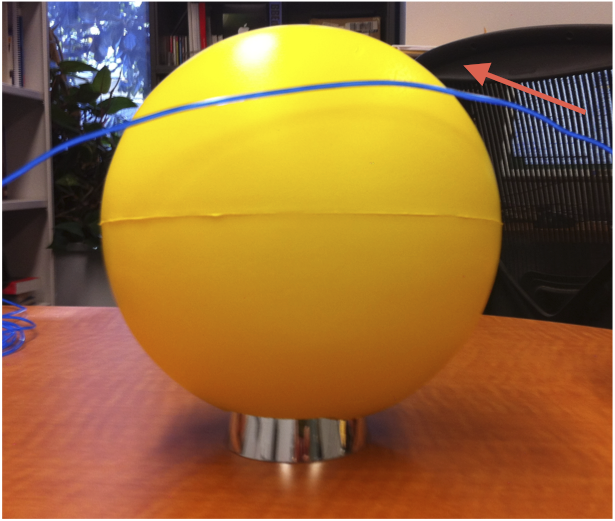 Magnetometers measure the strength and direction of the Earth's magnetic field. BGS scanned and released the records from several stations, including the Greenwich station we show here. On the top is the day of the flare. In the oval in the upper right is the effect of the solar flare at 11:18 am. (Perhaps you can figure out the times in these plots!) 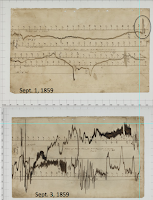 Other than a few small changes, the traces on 9/1/1859 look pretty smooth. A coronal mass ejection, a large surge of particles from the Sun, often comes with a flare. In the lower plot are the traces from two days later, while the particles ejected from the Sun at the same time as the 9/1/1859 flare are hitting the Earth's magnetosphere. The traces cover the page, with many rapid changes. People started associating flares on the Sun with the changes in the magnetic field being measured by the magnetometers. This was not just scientific curiosity. Those changes in the magnetic field affected the telegraph system, shocking the operators and allowing them to send messages without batteries while the aurora caused by the solar storm pulsed overhead. Today we watch the Sun for signs of flares and coronal mass ejections with SDO and other satellites. We monitor the Earth's magnetic field at stations of the BGS and other organizations. Space weather continues to affect our lives when it disrupts radio communications just like it disrupted telegraphs in early September, 1859. This anniversary was celebrated on The Writer's Almanac, along with a poem about watching a James Bond movie. 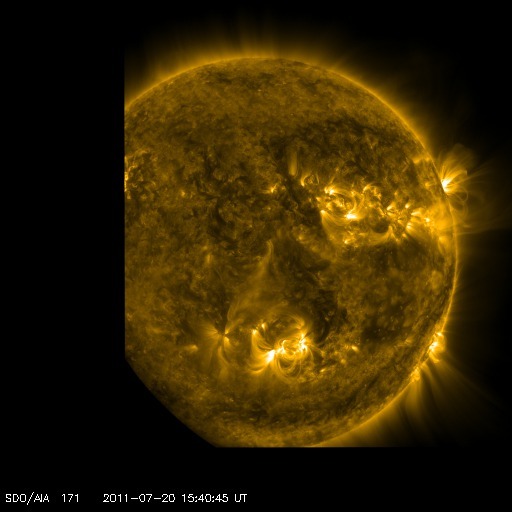 A pair of dynamic active regions rotated into view as SDO caught the activity over for a little over two days (Aug. 15 – 17, 2011). One can compare the activity in this side-by-side-by-side video clip in three wavelengths. At left, plasma near the surface is shown at 60,000 degrees in extreme ultraviolet light. Note that the feature rising up above the Sun’s edge between the active regions is a quiescent prominence. The middle portion with many looping arcs, also in extreme UV light, shows plasma heated to about a million degrees. The right portion shows the magnetically intense sunspots themselves that are the sources of all the activity. These areas have produced smaller solar storms and could yet generate stronger ones. Time will tell. Note added Tuesday morning: EVE data will be unavailable Wednesday morning for about 2 hours starting at 11 am ET to replace hardware in data farm. Sunspots, dark features in the solar photosphere with strong magnetic field, have been observed for more than 400 years. 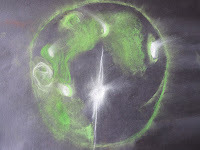 They are the most visible components of regions where solar flares and coronal mass ejections (CMEs) occur, and these eruptive events may cause power outages and interruptions of telecommunication and navigation services on the Earth. Although it is widely believed that sunspot regions are generated in the deep solar interior, the detection of these regions before they emerge from the convection zone into the photosphere has remained undetected until now. Stanford scientists report today the detection of several sunspot regions in the deep interior of the Sun, 1-2 days before they appear on the solar disc. Their results show that sunspots are generated at least 60,000 km below the surface and emerge from this depth up to the surface with an average speed of 0.3-0.6 km/s. 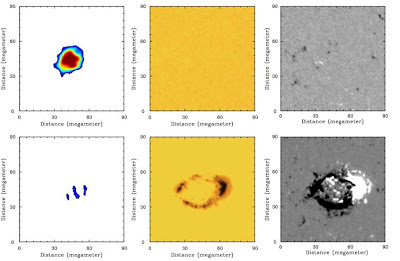 The detection of sunspots in the solar interior may provide useful warnings about upcoming surface magnetic activity which can be used to improve and extend the predictions of space weather forecast. The technique that they used to detect the sunspots is called time-distance helioseismology , and it is similar to a technique used by seismologists to image the Earth's interior. The results are reported by Stathis Ilonidis, Junwei Zhao, and Alexander Kosovichev in the paper "Detection of Emerging Sunspot Regions in the Solar Interior" published in the August 19 issue of Science Magazine (vol. 333, pp. 993-996, 2011). Acoustic travel-time perturbations detected at a depth of about 60,000 km (left) and simultaneous observations of the photospheric intensity (middle) and magnetic field (right). The images of the upper row were taken at about 03:30 UT 26 October 2003 and those of the lower row about 2 days later. SDO2 antenna maintenance was performed on 8/7 and 8/10 to isolate and remedy low signal levels on the right hand circular polarization (RHCP) path. Maintenance was planned for 8/12 to complete the repair ahead of handover season, which begins on 8/15. However as of 8/15 the maintenance is waiting on availability of a cable; efforts to acquire the cable are underway. 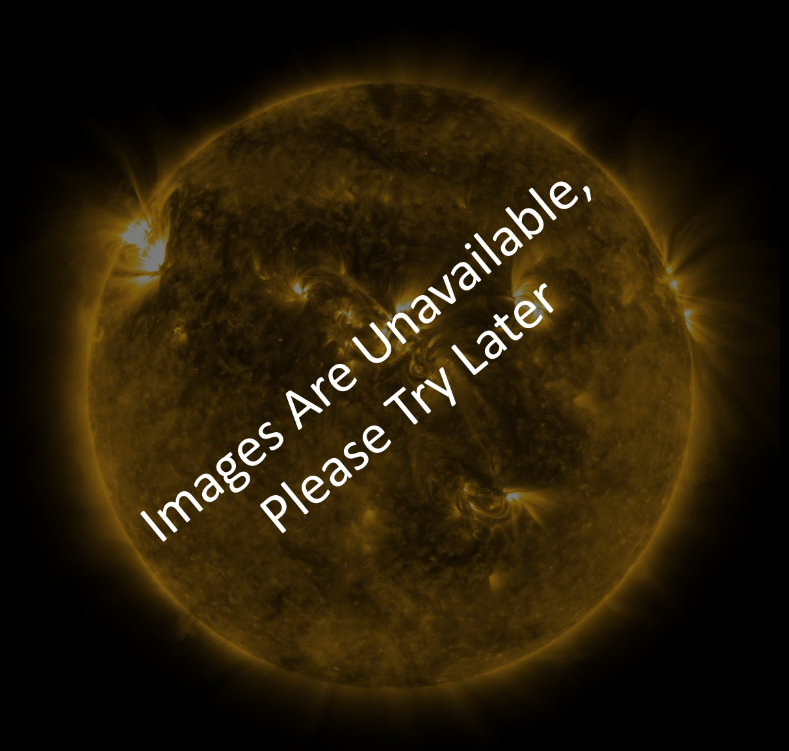 Discovery is hosting a set of SDO pictures at news.discovery.com. 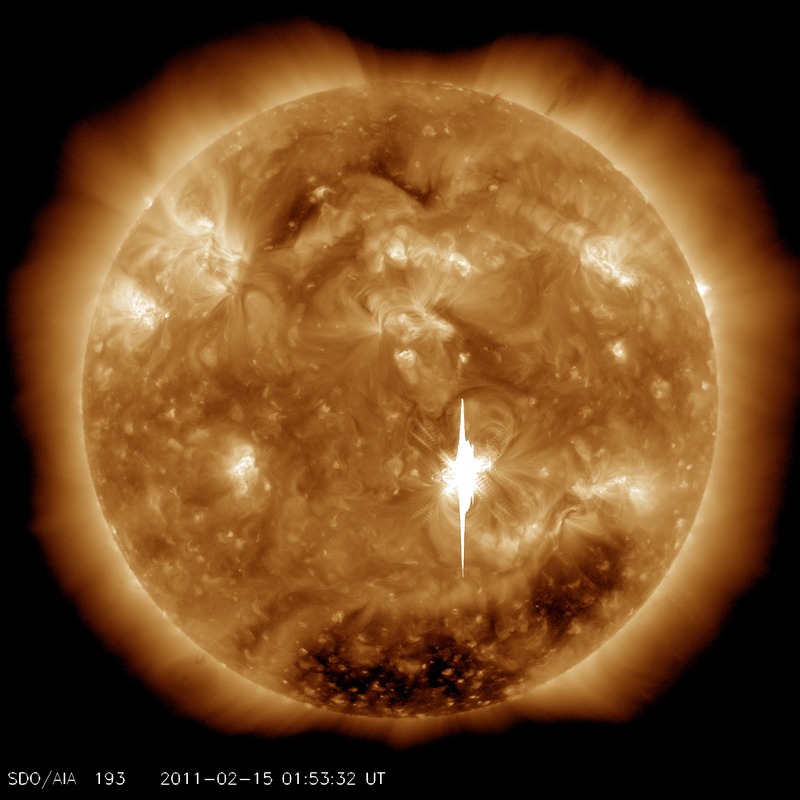 The largest solar flare yet this solar cycle occurred this morning, August 9, 2011 at 8:05 UT. 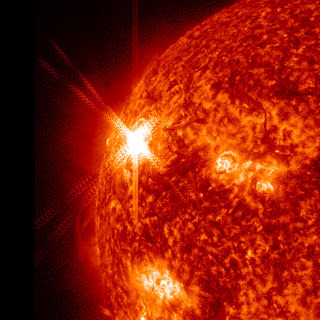 This flare had a GOES X-ray magnitude of X6.9, meaning it was more than 3 times larger than the previous largest flare of this solar cycle - the X2.2 that occurred on Feb 15, 2011. 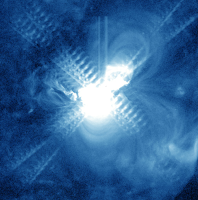 Here is a movie of this flare, created with JHelioviewer (http://jhelioviewer.org) that contains images from SDO/AIA in the 171 and 304 Angstrom wavelengths. A video clip shows an interesting alignment of three good-sized sunspot groups that present the potential for producing solar storms are rotating to the center of the Sun where any eruptions from them could affect us here at Earth (July 28-29, 2011). The lead group has the kind of magnetic field that could produce a large (X-class) flare. 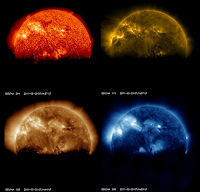 The images were taken by SDO's HMI Intensitygram that shows the Sun as it would be seen in filtered white light. This is likely the best parade of sunspot groups we have seen with SDO. And take note of this: each of these sunspots is larger than Earth. Let's see if any fireworks ensue. On Wednesday July 20 SDO did two maneuvers, an EVE field of view from 1315-1600 UT and an HMI off point from 1630-1910 UT. During these maneuvers the near real time images look cut-off and some data may have been lost. An example of a shifted image is shown on the left. Unlike earlier maneuvers, where the image moved around in the picture, the NRT software is centering the image and we see the edge of the CCD as a straight line. On 7/16 the MOC backup Real-Time system lost 3 hours of S-band data due to a line hit causing a socket disconnect. The primary string was unaffected so there was no impact. We have been told that the electricity will be shut off in the room with the Goddard SDO computers this weekend. This means the website will be down from 6:00 am to as late as 3:00 pm ET. The instrument websites are not affected by this outage and neither is the satellite. Sorry for the inconvenience. SDO will again be off-pointing away from the Sun today, July 13, so don't be surprised to see partial Sun images, streaks, or no Sun at all! This is a planned maneuver that happens four times per year in order to help the EVE instrument more fully understand its pointing and wavelength calibration. These quarterly events are referred to as "EVE Cruciforms" as the spacecraft is pointed at various angles in pitch (up and down) and then in yaw (left to right) that make a cross-like pointing pattern centered on the Sun. 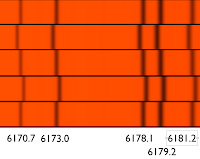 The FOT discovered a discrepancy between the Inertial reference Units (IRU) alignments and scale factor presently onboard in the Single Board Computer (SBC) Table 73 and those which were supposed to be in use. The differences are small, and the effects minimal, so the plan is to do nothing at this time, since time out of science mode (~ 1 hour) is required to validate an alignment table change per current procedures. The current plan is to wait until the next eclipse season this fall to correct the problem. An audit of all other alignment parameters has been started to look for any other discrepancies. The FOT completed simulations for the momentum unload scheduled for 7/6 at 19:17 GMT. The Command Authorization Meeting (CAM) will be held on 7/5 after the weekly planning meeting. Update: The AIA images are now flowing without interruption. However, it will be several days until we are able to fill in the missing data, so some of our movies will continue to reflect the "patchy" coverage from earlier. Thank you for your patience and continued support. 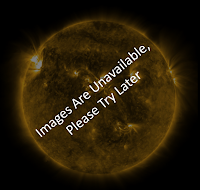 Recently, there have been some minor issues in transferring AIA images to the SDO server, and as a result we haven't been getting new images at the usual rate of 15 minutes. The mission is still operating nominally, and none of the images have been lost - the problem exists on the ground, and we hope to have it fixed soon. PALO ALTO, Calif., June 15, 2011 - Scientists using the Atmospheric Imaging Assembly (AIA) instrument on board NASA's Solar Dynamics Observatory (SDO), have detected quasi-periodic waves in the low solar corona that travel at speeds as high as 2,000 kilometers per second (4.5 million miles per hour). These observations provide, for the first time, unambiguous evidence of propagating fast mode magnetosonic waves at such high speeds in the Sun's low atmosphere. Dr. Wei Liu, a Stanford University Research Associate at the Lockheed Martin (NYSE:LMT) Solar and Astrophysics Laboratory (LMSAL) at the company's Advanced Technology Center (ATC) in Palo Alto, presented the findings Wednesday at the annual meeting of the Solar Physics Division of the American Astronomical Society, in Las Cruces, N.M. A paper detailing the discovery has been accepted for publication in The Astrophysical Journal Letters. It is well known that the hot plasma in the solar corona oscillates and produces propagating waves when "kicked" by a flare or eruption, similar to ripples in water produced by dropping a rock into a still pond. Theories and computer models predicted the existence of slow and fast moving waves, and the former were clearly seen by solar observatories in space. However, clues for fast moving waves were seen only briefly in the past during a solar eclipse on the ground, because previous space telescopes could not take pictures rapidly enough to image these fast waves. "It is the high temporal and spatial resolution of AIA that enables us to see these waves clearly for the first time. AIA takes high sensitivity, extreme ultraviolet (EUV) pictures of the solar corona at spatial scales down to 1100 kilometers, every 12 seconds with 0.1-2 second exposures," said Dr. Liu, who led the analysis of the waves. "In addition, AIA's full Sun field of view at seven simultaneous wavelengths allows us to track them over large spatial and temperature ranges." The waves are typically successive, arc-shaped fronts of intensity variations, similar to water ripples, which emanate near a flare kernel in the wake of a coronal mass ejection and propagate along a funnel of coronal loops. They have velocities of 1,000–2,000 kilometers per second, periods in the 30–200 seconds range, and wavelengths of 100,000-200,000 kilometers that is equivalent to stacking eight to sixteen Earths atop one another. "Their characteristic spatial and temporal scales and dispersion relation agree with theoretical expectations of fast mode magnetosonic waves, and are reproduced in our high fidelity 3D computer simulations," said Prof. Leon Ofman of the Catholic University of America, part of the team that made the discovery. "They seem to be a common phenomenon. 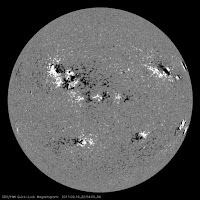 During the first year of the SDO mission, despite the Sun being relatively quiet, we have seen about a dozen such waves," said Dr. Karel Schrijver, principal physicist of LMSAL. "Although their exact trigger mechanism is currently under investigation, they appear to be intimately related to flares that sometimes exhibit pulsations at similar frequencies." Waves such as these are believed to be responsible for many fundamental, yet enigmatic processes on the Sun, such as heating the corona to millions of degrees, accelerating the solar wind, triggering remote eruptions, and delivering energy and information between different parts of the atmosphere. Knowledge of these waves obtained directly from observations is key to understanding the physics of such processes and thus their profound consequences on near-Earth space and the terrestrial environment. "This discovery and analysis is very significant because we are witnessing phenomena of which we were previously unaware. In light of this discovery, the more we look at solar flares, the more of these waves we see, and as observation and analysis lead to insight, the better we will understand the processes involved," said Dr. Alan Title, AIA Principal Investigator at LMSAL who first noticed the fast propagating waves in routine AIA movies. "The findings announced today are an example of the fruit of a two decade long collaboration, of which we are enormously proud, between Lockheed Martin and Stanford University." SDO is the first mission and flagship of NASA's Living with a Star (LWS) program launched near the onset of the new solar cycle on February 11, 2010. The goal of LWS is "to improve our understanding of how and why the Sun varies, how the Earth and Solar System respond, and how the variability and response affects humanity in Space and on Earth." SDO carries three state-of-the-art instruments: the AIA observing the tenuous solar corona permeated with magnetic fields, the Helioseismic Magnetic Imager (HMI) observing the surface Doppler velocity and magnetic field, and the Extreme UV Variability Experiment (EVE) recording the spatially integrated EUV spectrum of the Sun as a star. According to the LWS program scientist, Dr. Lika Guhathakurta of NASA headquarters, "SDO is our 'Hubble for the Sun'. It promises to transform solar physics in the same way the Hubble Space Telescope has transformed astronomy and cosmology." The Solar and Astrophysics Laboratory at the ATC conducts basic research into understanding and predicting space weather and the behavior of our Sun including its impacts on Earth and climate. It has a 47-year-long heritage of spaceborne solar instruments including the Soft X-ray Telescope on the Japanese Yohkoh satellite, the Michelson Doppler Imager on the ESA/NASA Solar and Heliospheric Observatory, the solar telescope on NASA's Transition Region and Coronal Explorer, the Focal Plane Package on the Japanese Hinode satellite, the Solar X-ray Imagers on GOES-N, -O and -P, the Extreme Ultraviolet Imager instruments on NASA's twin STEREO spacecraft, and the Helioseismic and Magnetic Imager and the Atmospheric Imaging Assembly on NASA's Solar Dynamics Observatory. The ATC is currently building both the science instrument and spacecraft for NASA's Interface Region Imaging Spectrograph (IRIS), a Small Explorer Mission scheduled for launch in late 2012. 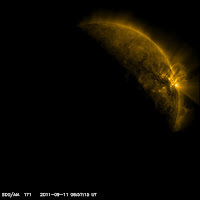 We have added a new addition to the SDO website. 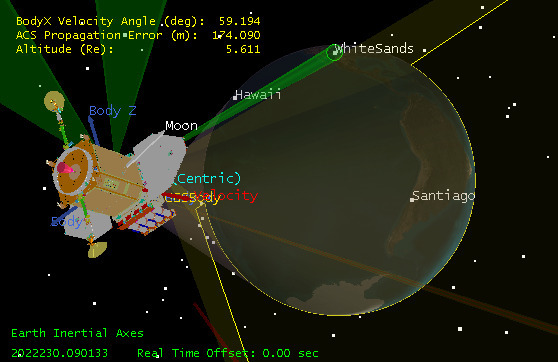 Navigate to http://sdo.gsfc.nasa.gov/mission/moc.php and you will see the latest graphical representations of SDO's orbit. These images are updated every ten minutes. Next week many SDO scientists will be in Las Cruces, NM for the AAS Solar Physics Division meeting. Dean Pesnell will give the public talk, The Many Colors of the Sun, Monday nite in Atkinson Hall on the campus of New Mexico State University. This week's prominence eruption will probably be a part of the talk! On June 7 the antenna pedestal insulation work began on SDO2 and is expected to be completed on June 15. Work on the SDO1 pedestal insulation will begin on June 20. On June 7 at 6:41 GMT SDO captured images of a spectacular coronal mass ejection (CME), see http://sdo.gsfc.nasa.gov/gallery/main.php?v=item&id=80. SDO observed the flare's peak at 1:41 AM ET. SDO recorded these images in extreme ultraviolet light and they show a very large explosion of cool gas. It is somewhat unique because at many places in the eruption there seems to be even cooler material -- at temperatures less than 80,000K. When viewed in SOHO's coronagraphs, the event shows bright plasma and high-energy particles roaring from the Sun. This Earth-directed CME is moving at 1400 km/s according to NASA models. Due to its angle, however, effects on Earth should be fairly small. Nevertheless, it may generate space weather effects here on Earth in a few days. Although solar activity remained low this week we did see a few interesting prominence eruptions. On May 31 the SDO1 antenna data path experienced an apparent radio frequency interference (RFI) event that lasted several seconds. There was no data loss. If you are in New York this weekend be sure to join SDO team members at the World Science Festival on Governor's Island. We will have solar telescopes, talks about the Sun by Dean Pesnell and Timothy Ferris, and other activities describing magnetism and solar observations. For a schedule of events visit the World Science Festival website. SDO is featured in the Science on Site: Explorations on Governors Island event, Saturday, June 4, 2011 10:00 AM - 6:00 PM. See you there! A guide telescope PZT calibration was executed today. The AIA 304 channel is showing some loss of sensitivity. We will be running that channel at a slower cadence (1 image in 304 per minute) rather than every 12 seconds as we have been doing. This will be tested today (5/27) and run for several months starting 5/30. 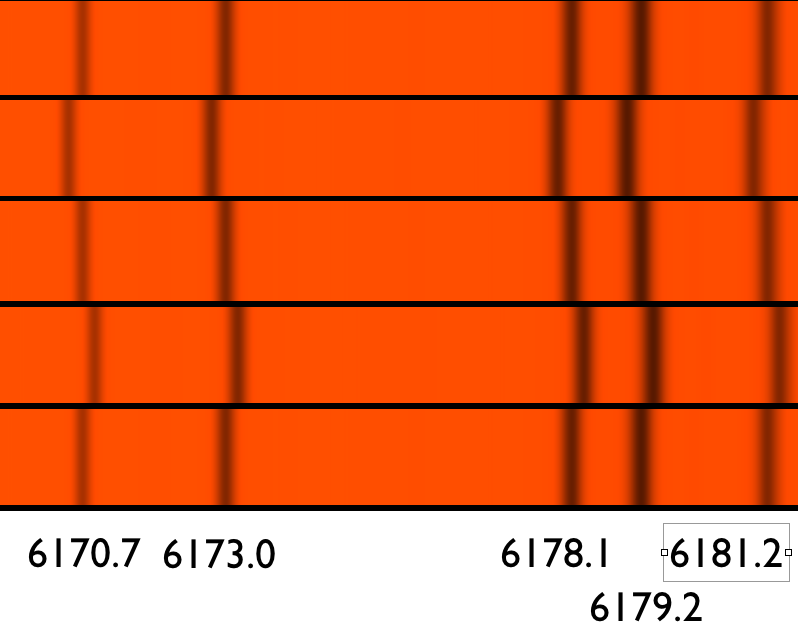 The 94 channel that shares the telescope and CCD with the 304 channel does not show the same loss, so it will be run more frequently (1 304 image per minute and 4 94 images per minute). 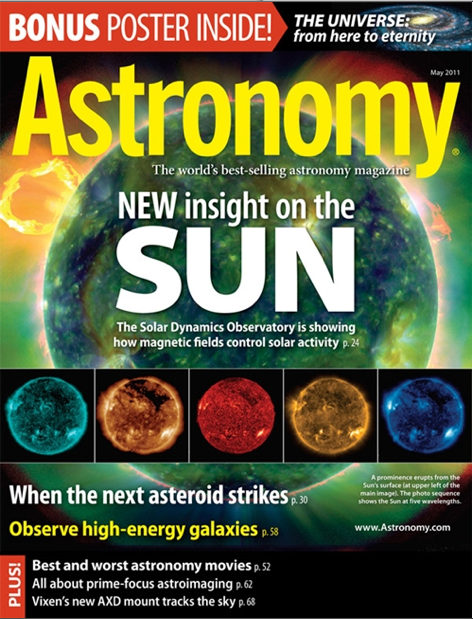 "Solar Dynamics Observatory Lessons Affirmed," an article discussing some of the engineering lessons learned during the building of SDO appeared in ask Magazine, a publication that discusses project management and engineering at NASA. The article was written by Brent Robertson, last seen being the observatory manager for SDO, and Michael Bay, a member of the award-winning SDO Systems Engineering team. National Geographic Education published an interview with Phil Chamberlin, SDO Deputy Project Scientist, on May 11, 2011. Congratulations to Phil on a great article about GPS and becoming an astrophysicist! I received a request to tell the history of the SDO patch. The patch is derived from the sticker developed early in the mission. Initial designs of the sticker were produced by a graphics designer using an early version of the spacecraft. After a redesign, the spacecraft was replaced with the current version; the sticker was re-issued (see the version at the left) and the patch was designed and released. We are a solar mission and the Sun is prominently featured in the patch. The Sun is shown coming out of eclipse, which happens periodically from our geosynchronous orbit. The abbreviations for the three instrument teams are placed in the lower border, the NASA acronym is at the lower edge of the central image, while the motto "Our Eye on the Sun" is placed in the upper border. The name of the observatory is the uppermost element in the lower part of the central image. The motto was generated by members of the SDO Project team working with people from NASA headquarters. 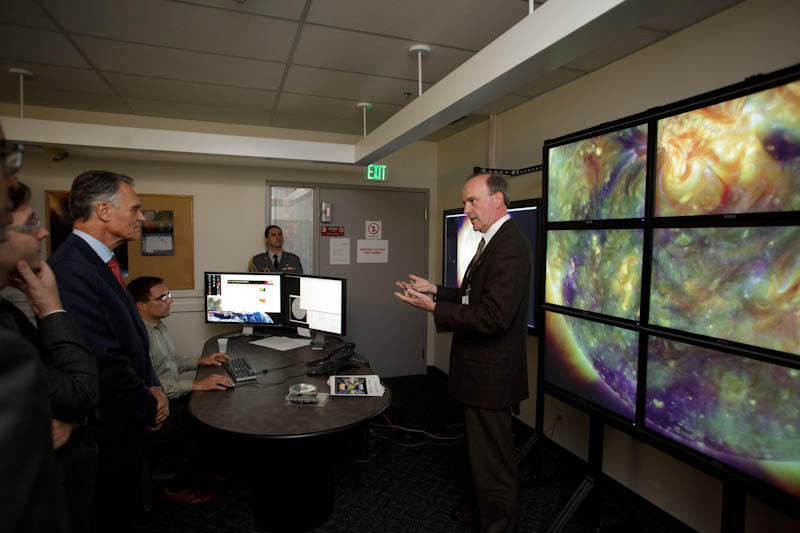 It emphasizes the almost 24/7 coverage of the Sun that SDO provides. It calls back to other sayings, such as "Don't Look at the Sun, That Our Job" that we had seen in other solar missions. SDO is now in its operational orbit and producing the data that lives up to its motto. Starting at 1600 UT today, May 19, 2011, the AIA 304 and 94 Å channels will be unavailable. The decontamination heaters will be turned on to drive contamination off of the CCD in that telescope. Other channels will be unaffected. The SDO Flight Operations Team supported a nominal lunar transit on Tuesday, May 3. The FOT supported momentum unload maneuver (delta-H) #5 on May 4 at 1800 UT. The delta-H burn time was 3.8 seconds. 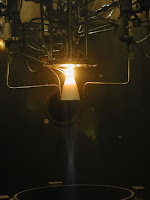 Thruster 6 was fired for 150 milliseconds one minute prior to the delta-H burn in order to help prevent iron nitrate buildup in the fuel line. Momentum unload maneuvers are used to change the speed of the reaction wheels used to control where SDO is pointed. The SDO Science Workshop ended today with workshops on different parts of the mission. Here is a group photograph at the High Camp in Squaw Valley, CA. A lot of talks and posters in 3.5 days! 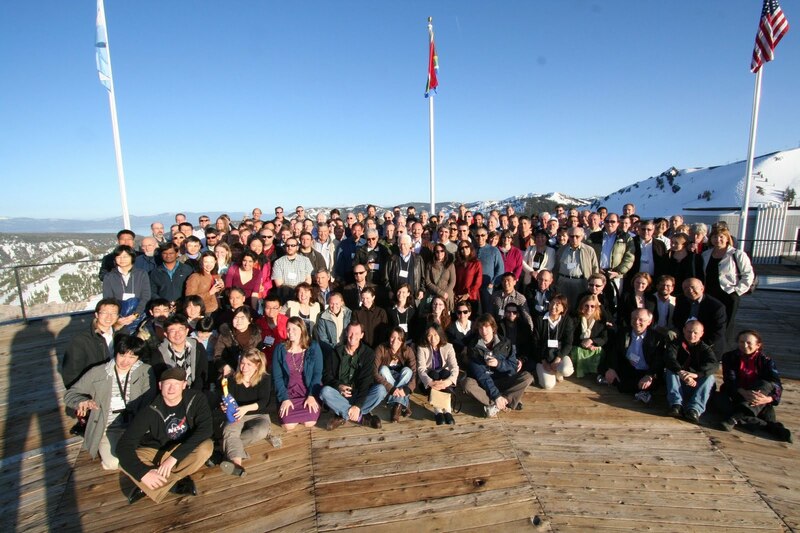 Two hundred scientists have gathered at a resort in Squaw Valley, California to share their new results about the SDO data and science results. Monday had discussions about emerging sunspots and how to relate solar studies to other stars. Hope you enjoyed the lunar transit this morning! Here is a picture from AIA 193 at 0729. At 1803 UT (2:03 pm ET) Wednesday, May 5, SDO will do a thruster burn to control the momentum in the reaction wheels of the spacecraft. There will be an interruption of data from about 1758-1812 UT but the actual length will be determined by the thruster control software. 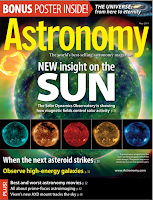 Check out the cover story on SDO in the May issue of Astronomy magazine. Students at St Cronans National School were asked to draw pictures of the Sun to celebrate Sun-Earth Day 2011. They were allowed to look at SDO images for their inspiration. From the 49 pictures the top three are shown here. 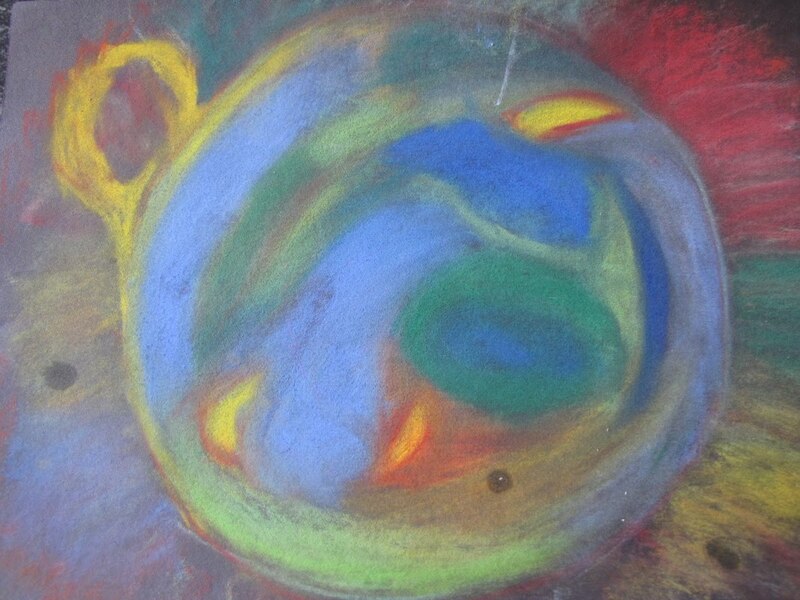 The First Place drawing was inspired by the composite image from the SDO First Light. Second place was inspired by the solar flare at disk center on Valentine's Day. 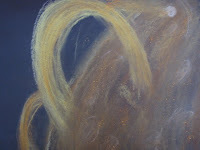 The image selected for third place was inspired by coronal loops seen against the limb of the Sun. All the drawings were done using soft pastels on black paper during a special workshop at the school on March 15th. A pack of NASA solar educational materials, DVD's Posters, etc., was given to each student. Congratulations to the class for safe solar viewing and thanks for the pictures! The SDO EVE calibration rocket flight today was very successful. We launched on time (11:50 MDT, 17:50 UT) and all the rocket and flight SDO quick-look data look excellent. Thanks for all those at WSMR, NASA, NSROC, and LASP for supporting this successful mission ! Congratulation to Tom and the EVE Science Team for a successful launch! Mar 23, 9:00 AM MDT: Experiment sections are ready for flight. Final arming of the launch vehicles have begun. Weather report is still Green for launch. Mar 23, 8:10 AM MDT: Horizontal test completed. Starting preparations for flight. Mar 23, 7:30 AM MDT: CCDs are down to -40 C. Getting ready for Horizontal (turn-on) test at 7:50 AM. Mar 23, 6:30 AM MDT: Instrument CCDs are cooled down to -20 C. Plan is to be at -65 C for launch time. Mar 23, 4:30 AM MDT: Andrew on-station and cooling of CCDs have started. Payload pressure is 0.12 milliTorr at start of cool down (Pump IG pressure of 1.3 microTorr). Weather looking great for launch today: 61 F, sunny, low winds forecasted for launch time. Based on continued unacceptable (red) wind conditions for Tuesday March 22 and very good weather conditions forecasted for Wednesday, the launch for NASA 36.275 is now scheduled for Wednesday March 23. That is, we have scrubbed plans to attempt launch on Tuesday. There are 3 launch dates reserved next week for the SDO EVE Calibration Rocket (NASA 36.275). The weather forecasts are for unacceptably high winds on Monday March 21, but acceptable winds on Tue March 22 and Wed March 23. We plan to decide tomorrow (Thur 3/17) on whether we’ll give up the range for March 21 and only try for launches on Tuesday or Wednesday. The launch window is 11:50 AM - 12:20 AM MDT (17:50 - 18:20 UT) for all three days. The spring 2011 eclipse season has begun. 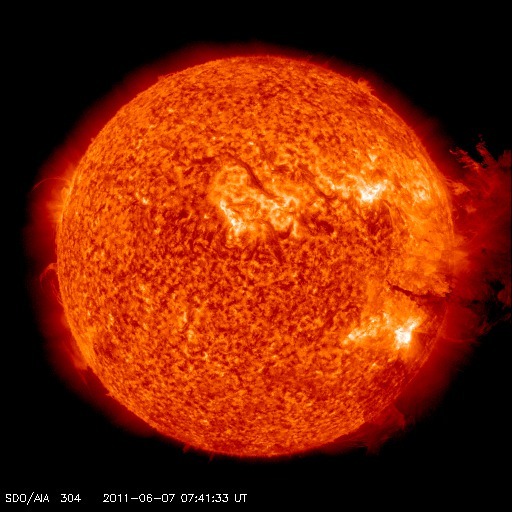 Every day until April 2, 2011 there will be a short break in the data flow as the Earth moves between SDO and the Sun. The length of an eclipse can be as long as 72 minutes and they happen at about midnight at our ground station in Las Cruces, NM (0700 UT). The EVE calibration rocket flight from WSMR is scheduled for 3/22 between 1800-1830 UTC. The Sunspot Number is 122 (at the time of this post) and there have been several M-class flares and an elevated chance of X-class flares. This plot from SDO's EVE investigation shows the increase in flare activity observed by EVE's EUV SpectroPhotometer (ESP). 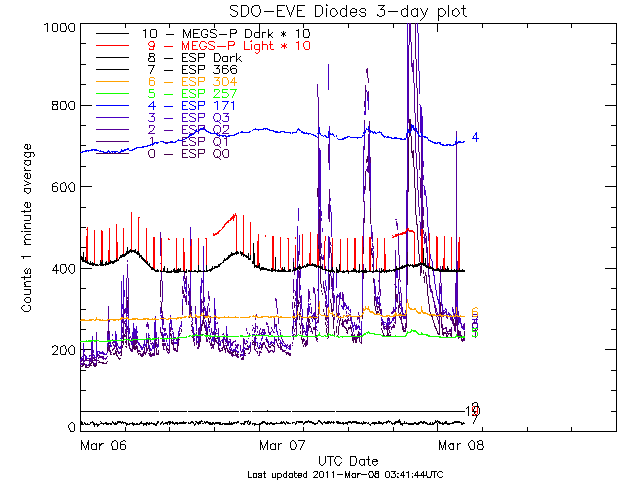 See the most recent EVE 3-day plot and more. AIA data is flowing again to the Sun Today webpage at LMSAL and The Sun Now on the SDO website. The AIA NRT data stream from the JSOC-SDP to LMSAL has been shut down. SDO team members are running some tests over the weekend to isolate the problems with the connection between LMSAL and the JSOC/SDP. Most of these should be transparent to the community. However, the NRT data stream generates the data products seen on Suntoday, iSolSearch, Helioviewer, etc. The stream will be off overnight (pacific time) and will resume tomorrow morning. In addition, The generation of AIA level 1.5 generation has also been stopped to help alleviate a data generation volume problem at the JSOC. The AIA synoptic images at http://jsoc.stanford.edu/data/aia/synoptic/ are still available. SDO will observe a lunar transit today. Here is a video illustrating the transit. White Sands Missile Range has notified the EVE team that their calibration rocket is now delayed. The team will safe the payload and return to Boulder to await a new launch date. "Winds aloft have been steady and have been in red condition since getting here. 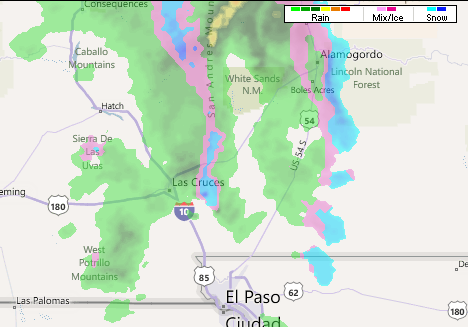 WSMR has scrubbed the launch for today. Backup dates being discussed (Friday Feb 25 and Wednesday Mar 2 seem to be candidates at this time)." You can keep track of the status at the LASP Rocket website. The EVE calibration payload is ready to go, but what will the weather do? NASA sounding rocket 36.275 is scheduled to launch today (February 23, 2011) from the White Sands Missile Range (WSMR). The launch window is from 11:20-11:50 MST, but the forecast as of yesterday afternoon indicated that wind may be an issue. 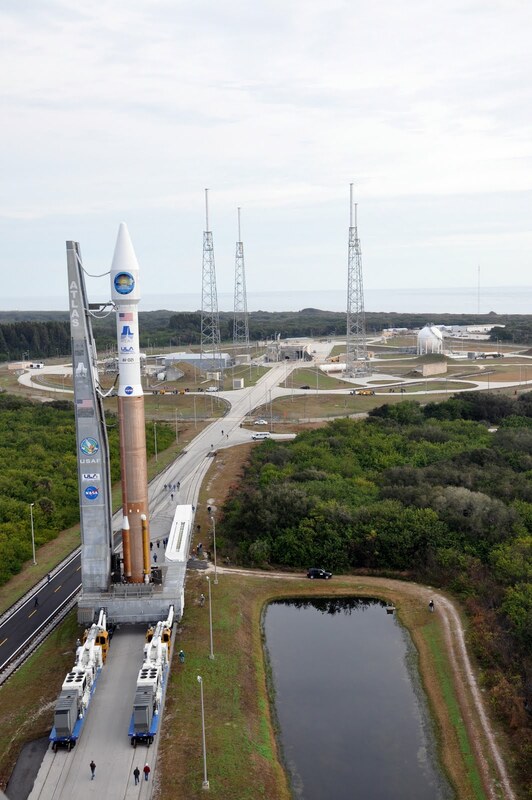 We hope the weather will cooperate, but if the wind is too severe, the launch will have to slip to a backup date. We wish the best to the EVE team! 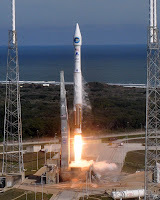 More information is at the LASP Rocket webpage. As of 10:00 am ET this morning the AIA images are about 15 hours delayed. The problems with the ground processing software have been corrected and the AIA data is being transferred to the JSOC in a FIFO queue. This means the earlier data is being sent before today's data. All science data has been captured from the instrument. HMI and EVE data are current at this time. Solar storms and space weather were a feature at this year's meeting of the AAAS in Washington, DC. Story (including an AIA image) is at Space.com. The next launch of our EVE calibration payload is on NASA sounding rocket 36.275 planned for February 23, 2011 from the White Sands Missile Range (WSMR). This flight will provide the second underflight calibration for the SDO EUV Variability Experiment (EVE) instrument. The first calibration rocket flew on May 3, 2010 (NASA 36.258, the Black Brant rocket is shown "on the rail" at left). The launch window is from 11:20-11:50 MST. This is near local noon to minimize the atmospheric absorption of the solar EUV radiation observed during the rocket flight. Unlike the TIMED rockets, where SEE had to also be turned on, EVE is taking data all the time. More information is at the LASP Rocket webpage. 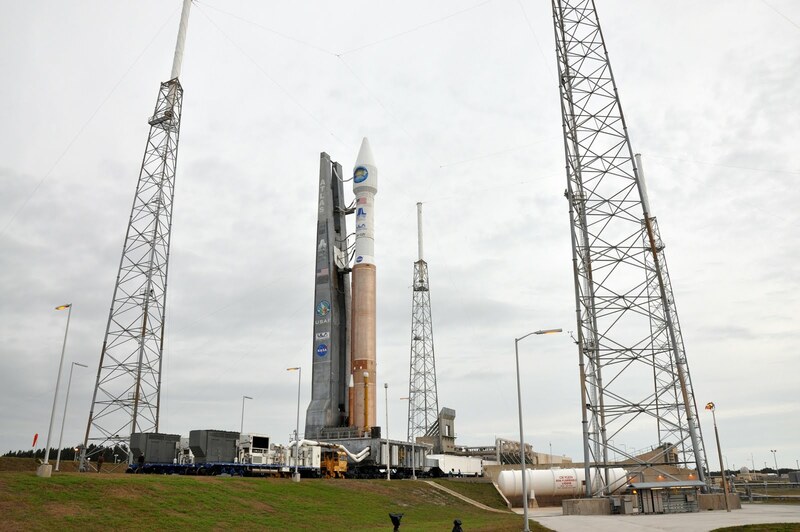 Due to security regulations, we cannot provide realtime coverage of the launch. Check out the video that was shown during SDO's First Anniversary Party on 2/14/2011. The video is in the SDO Gallery or follow this link. Active region 1158 let loose with an X2.2 flare at about 0150 UT or 8:50 pm ET on February 14. This makes it the biggest flare so far in Solar Cycle 24. AR 1158 is in the southern hemisphere, which has been lagging the north in activity but now leads in big flares! Here is a blowup of the flaring region at 0153 UT (February 15, 2011) in AIA 335. 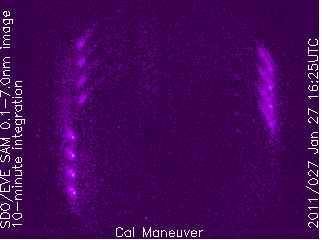 Many of the short lines in the image are not part of the flare but are from light scattered on the inside of the telescope. More on that later. A M6.6 solar flare has just occurred, peaking at 17:38 UT on Feb 13. This is the largest solar flare so far from this solar cycle based on X-ray irradiance magnitude. Check for other movies and images on the SDO website! 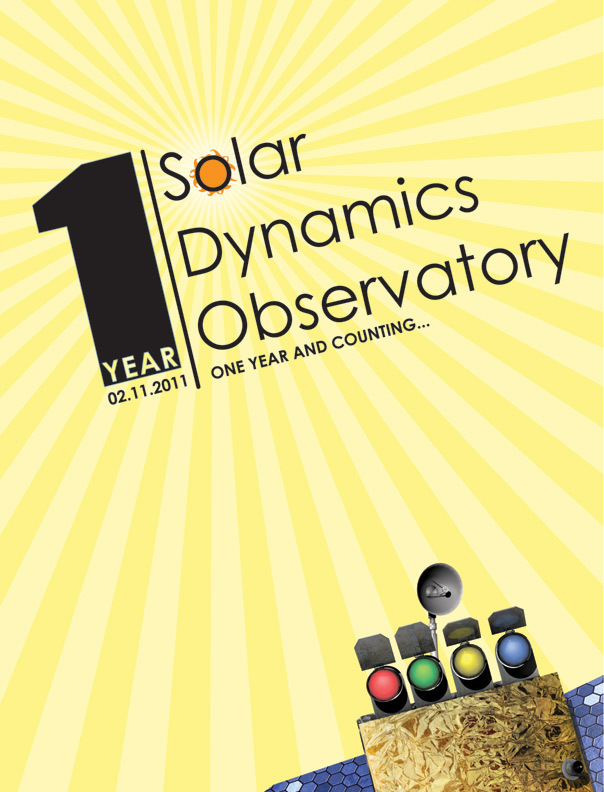 SDO Launched One Year Ago! 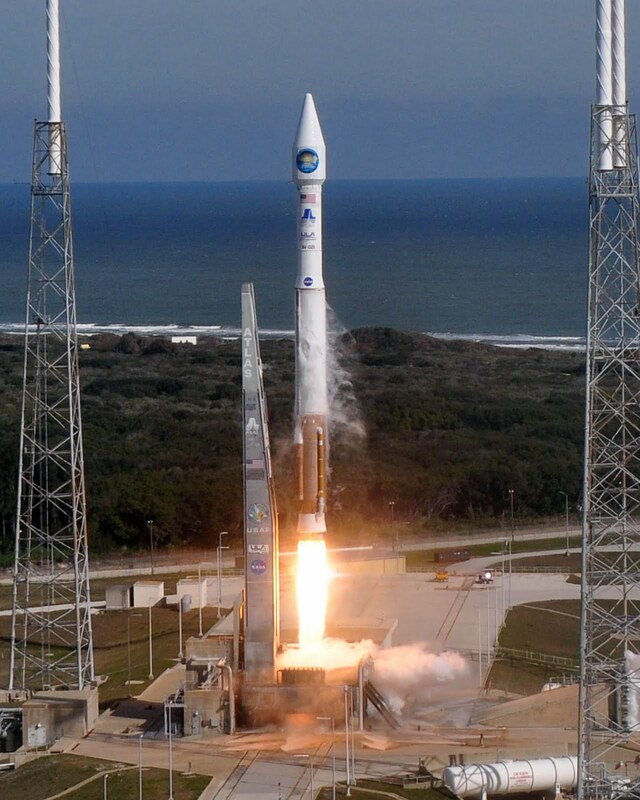 At 10:23 am ET February 11, 2010, SDO launched from SLC 41. 108 minutes later SDO became a spaceship! SDO Moved to the Launch Pad and the Winds Blew! On February 9, 2010 the launch vehicle carrying SDO moved from the Vertical Integration Facility (VIF) to the launch pad at SLC 41. It was quite an impressive display. The upper picture shows the view from the VIF. Two locomotives pushed the launch stack at a comfortable walking speed toward the pad in the distance. Trailers filled with SDO computers that would monitor the spacecraft until launch are in front of the rocket and will be pushed into tunnels for protection during launch. The next photo shows the stack as it arrives at the pad. (The towers are lightning arrestors that surround the pad.) The grey spar next to the rocket is an important player in the launch sequence. It supports power and telemetry cables to the payload and the Centaur second stage (the narrow part of the stack.) It also carries a tube that blows clean nitrogen into the instruments to keep away contaminants. On February 10 it played a different role. That morning the launch window opened at 10:26 am ET. The winds must be below a maximum speed to allow a launch to proceed. One direction, from roughly the northwest, is the most critical because such a wind would push the spacecraft toward the spar. Of course, the strong weather pattern that was pounding the Snowmageddon Launch Team in Maryland produced such winds. After waiting 50 minutes at T-10 minutes, the spacecraft was ordered into the final 10 minutes of the countdown. Two seconds after that the spacecraft detected wind gusts that were too high and shut down. SDO would remain on Earth for another day. 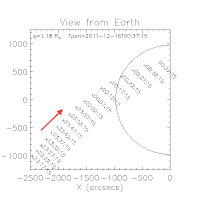 At 1940 UT (2:40 pm ET) on February 9, 2011 SDO will execute a Delta-H maneuver. This is a planned activity. Science data will be interrupted for about 30 minutes. The actual duration will be determined by the onboard software as it changes the reaction wheel speeds and fires the thrusters of the spacecraft to complete the maneuver. The goal is to adjust the reaction wheel speeds so we can maintain the pointing of the spacecraft over the next few months. Here is a picture of a test thruster being fired on the ground in 2006 (we cannot see the actual thrusters on the spacecraft.) The thrusters should fire for up to 4 seconds. UPDATE: The maneuver was completed using 66.6 gr of propellant with the thrusters firing for 4.05 sec. The satellite was pointing away from the Sun for about 15 min. The winter of 2010 was cold, but the week of SDO's launch was also very snowy. 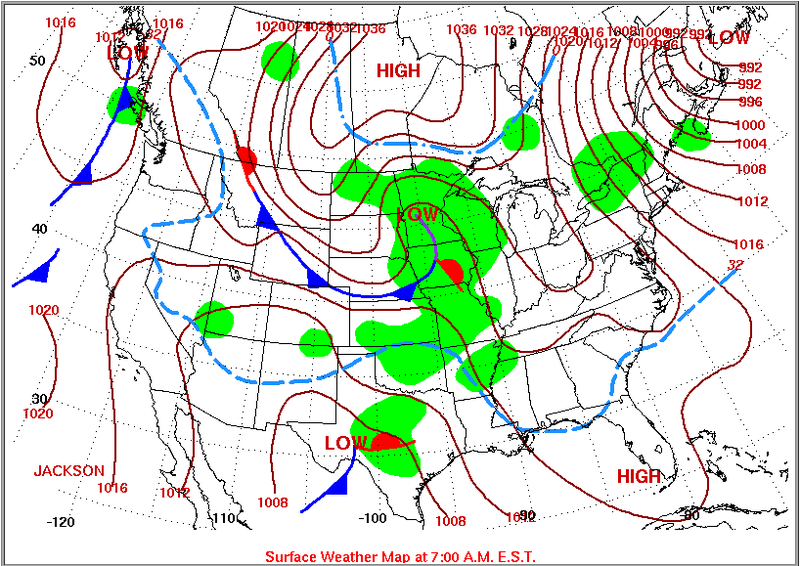 Here is the surface weather map for February 8, 2010. An enormous low pressure system was developing in the Midwest and moving toward the east. STS-130 roared into space in the cold morning of February 8, 2010. A 24 hour period was required before trying to launch SDO on February 10. That enormous low would move over the mid-Atlantic and leave two feet of snow, on top of the two feet that were dropped on February 5-6! This 48 inches of snow greatly complicated the lives of the SDO team at Goddard. To launch SDO we had to be able to take control of the spacecraft when it separated from the Atlas/Centaur launch vehicle. If the SDO team was not at Goddard we could not launch. This meant that the launch team moved into Goddard on February 9, 2010 to wait for launch in their offices and nearby hotels. Hats off to the Snowmageddon Launch Team! 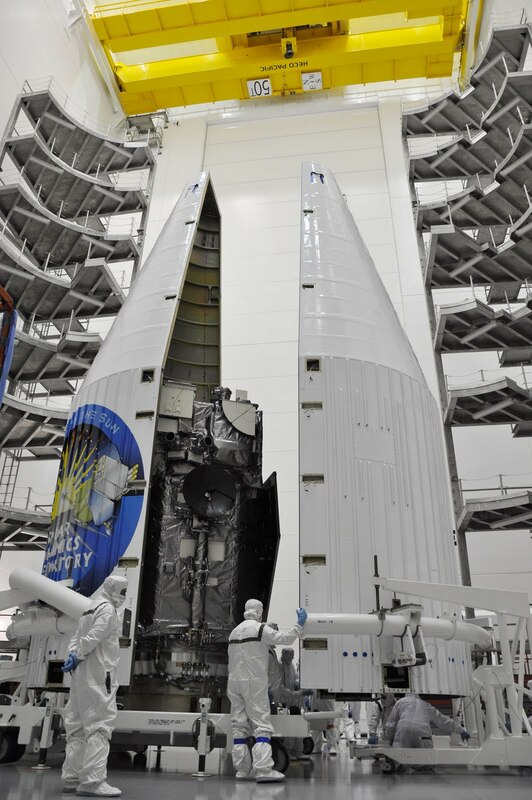 Just a little over a year ago, SDO was fueled and placed into a fairing. The next day we were hoisted to the top of our rocket. Here is one of our final looks at the spacecraft before it was sealed from sight.